On June 26, 2011, Premier Wen Jiabao visited MG Motor UK in Birmingham. MG Motor UK is the wholly-owned subsidiary of SAIC Motor Corporation Limited in Britain. 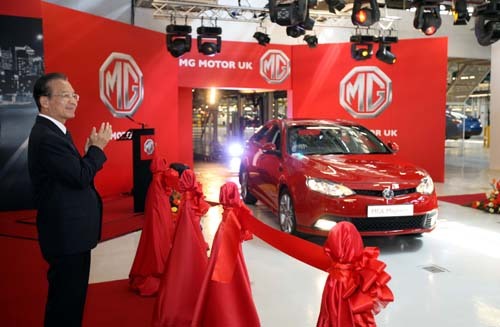 Built in 2005,MG Motor UK is the first Chinese automobile company with batch production and selling in the European and US markets and now has 400 British employees. Wen visited the company's demo and technical center, listened to introductions and held cordial talks with the Chinese and British employees. He later came to the assembly shop, viewed the assembly line and attended the MG6 new model line-off ceremony. In a spontaneous speech, Wen said that the MG6 project has created a brand-new model of "designed by Britain, produced by China, assembled by Britain". It effectively uses and combines the Chinese capital, labor and market as well as the British technologies and managerial experience. It is another sign of success of China-Britain friendly cooperation. He hopes the business communities of both countries continue to tap their potential, strengthen cooperation in the spirit of mutual respect, equal treatment and mutual benefit and strive for bigger success. The Chinese and British senior executives and employees of the company thanked Wen for his encouragement. They will keep innovation and produce more quality automobiles so as to make new contributions to promoting the economic growth of China and Britain and the bilateral cooperation.